King Solomon Swords for sale are 34 inches in all. 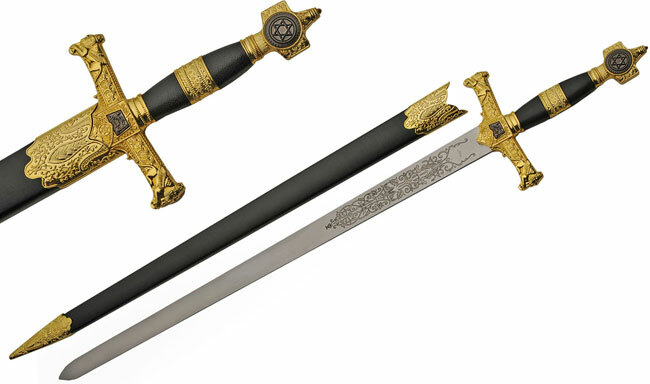 These ceremonial swords incorporate a religious motif featuring the six-pointed Star of David in the round pommel. The 22 inch blade is shiny and mirror polished with a display ready factory edge and is decorated with elaborate floral designs. These swords have a golden colored cross guard that is intricately detailed with religious symbols and designs and historical accents. The black spacers contrast strikingly against the antique golden colored handle. The black scabbard bears intricate patterns on the gold color tip and throat. Buy the King Solomon Swords for only $69.99.